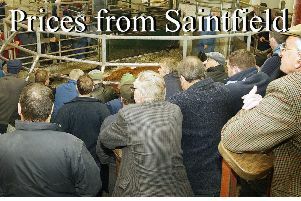 A sharper trade for all classes of stock saw steers sell to £1,240, 625kg Limousin (198.00). Heifers peaked at £1,160, 595kg Charolais (195.00); fat cows cleared to £800, 655kg Blonde d’Aquitaine (122.00); dropped calves peaked at £410 Belgian Blue bull and heifer calves to £365 Charolais; weanlings cleared to £1,000 for a 445kg Limousin steer (223.00), while weanling heifers peaked at £900, 410kg Charolais (220.00). A sharper trade for all classes of steers saw a top price paid of £1,240, 625kg Limousin (198.00) presented by P Hurson, £1,215, 565kg Limousin (215.00), £1,200, 595kg Limousin (202.00); L McElroy £1,235, 640kg Charolais (193.00); G McMaster £1,230, 635kg Aberdeen Angus (194.00), £1,200, 605kg Charolais (198.00); S and P Goodwin £1,110, 525kg Limousin (211.00), £1,000, 460kg Limousin (217.00); B Meneely £1,080, 535kg Charolais (202.00); R Gormley £1,060, 495kg Charolais (214.00), £1,030, 480kg Shorthorn (215.00), £1,025, 485kg Charolais (211.00), £1,025, 480kg Charolais (214.00), £970, 445kg Charolais (218.00), £965, 430kg Charolais (224.00); J Gormley £1,035, 460kg Charolais (225.00), £1,035, 470kg Charolais (220.00) and B Meenagh £830, 385kg Shorthorn (216.00), £810, 400kg Shorthorn (203.00). Heifer prices remain strong to peak at £1,160, 595kg Charolais (195.00) presented by J and J Livestock, £1,160, 555kg Charolais (209.00), £1,120, 545kg Charolais (206.00), £1,090, 555kg Charolais (196.00); B Cummings £1,120, 520kg Charolais (215.00), £1,090, 535kg Charolais (204.00); G Stinson £1,010, 455kg Limousin (222.00), £960, 440kg Limousin (218.00), £900, 430kg Limousin (209.00); S and P Goodwin £990, 445kg Limousin (223.00); J Redmond £970, 470kg Limousin (206.00), £890, 415kg Limousin (215.00), £880, 425kg Charolais (207.00); C Watt £910, 425kg Simmental (214.00), £910, 450kg Simmental (202.00); M Redmond £790, 375kg Limousin (211.00), £645, 335kg Aberdeen Angus (193.00) and T Colbert £715, 370kg Hereford (193.00). Dropped calves reached at height of £410 paid for a four week old Belgian Blue bull presented by R Burns; A Hopper £350 Belgian Blue bull; R Cuddy £290 Hereford bull, £200 Hereford bull; L and M Morton £250 Simmental bull, £230 Simmental bull; D Beattie £240 Limousin bull, £200 Aberdeen Angus bull; H Curry £225 Aberdeen Angus bull; W Maxwell £220 Hereford bull, £200 Hereford bull; T Muldrew £220 x 2 Hereford bulls; A Hopper £220 Belgian Blue bull; V McReynolds £215 Aberdeen Angus bull and G Booth £200 Belgian Blue bull. Reared Friesian bulls sold from £100 to £145. Meanwhile heifer calves sold to £365 Charolais presented by M Bloomer; M Redmond £355 Hereford heifer; H Rainey £340 Hereford heifer; W Maxwell £275 Shorthorn beef heifer; N Muldrew £235 Hereford heifer; V McReynolds £210 Aberdeen Angus heifer; T Muldrew £200 x 3 Hereford heifers and S Donaghy £195 x 2 Aberdeen Angus heifers. First choice lots continue to sell sharply with male calves topping at £1,000, 445kg Limousin (225.00) presented by G Cheevers; P Litter £990, 455kg Limousin (218.00), £870, 340kg Limousin (255.00); I and S McAleece £985, 395kg Charolais (248.00), £900, 395kg Charolais (228.00); S O’Neill £840, 365kg Charolais (230.00); G Stinson £805, 360kg Limousin (222.00), £695, 280kg Limousin (248.00); K Cullinan £775, 295kg Charolais (263.00), £650, 265kg Limousin (245.00); B Molloy £765, 320kg Limousin (239.00), £760, 340kg Limousin (224.00); J McKenzie £705, 295kg Charolais (238.00), £700 300kg Charolais (232.00); A Hopper £690 300kg Hereford (228.00), £645, 285kg Limousin (224.00); R Quinn £500, 200kg Charolais (250.00). Meanwhile weanling heifers sold to £900, 410kg Charolais (220.00) presented by B Molloy; K Cullinan £770, 335kg Charolais (229.00), £740, 315kg Charolais (233.00), £715, 285kg Charolais (252.00); I and S McAleece £720, 320kg Charolais (226.00), £670, 300kg Limousin (220.00), £660, 290kg Belgian Blue (228.00) and l Allen £530 x 2 265kg Aberdeen Angus (200.00).